Helping you be proud of the dog you love! Why is my dog fearful? Did you know training your dog did this? Take a Hike – With Your Dog! Properly introducing dogs to cats can help ensure they get off on the right paw. Many dogs can live successfully with cats if introductions are done properly and slowly. Here are some tips to prepare your home for a dog when you have a cat, how to select a dog to live with your cat, and how to lead the introductions so they are successful. Before you bring your dog home, make sure the cat’s litter box and feeding area are out of the dog’s reach. To a dog, a litter box is a big temptation, as is the cat’s food. To avoid behavior problems with your cat, the cat should be able to eat, drink and use the litter box without the dog being able to see or get to them. Baby gates with cat doors or adding cat doors to doors work great for this. These management tools and preparations should be put in place before you bring the dog home. Your new dog and your cat should be separated for the first week that the dog is in the home. The dog should be on a secure collar and leash for the introduction and any other time he could meet or see the cat. The goal is to prevent the dog chasing, lunging, or getting too close to the cat. If the introduction goes well, keep the dog on a leash (with the leash handle removed or cut in half to prevent it from catching on furniture) for the first month in the home. Having a leash on the dog at all times ensure that if a chase looks imminent, you can grab the leash to prevent it. 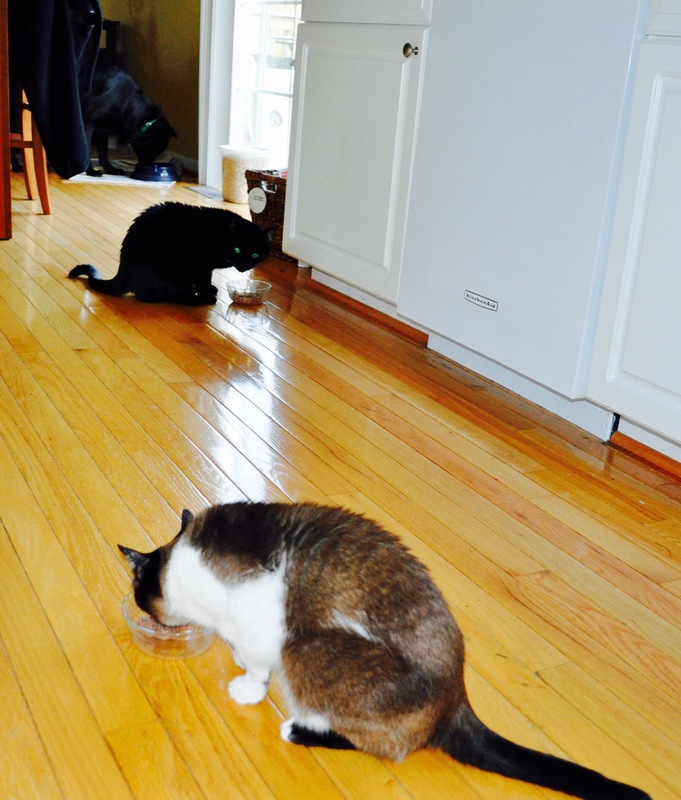 Have the dog sit and take treats near the cat. If the dog is able to sit and take treats, let him approach and sniff the cat. Many cats who are new to being around dogs will get defensive and can hiss, growl, swat at or try to run from a dog. Let the cat move away from the dog if it chooses too. Do not punish the cat for defensive behavior or the dog for being too interested in the cat. If the dog is excited by the cat, back him away return to having him sit for treats. Repeat this step several times over the course of a few weeks before progressing to the next step. It can take 30 days or more for dogs and cats to get comfortable around each other. Go slow and have patience with dog and the cat. If the dog and cat meeting sessions continue to go well (no chasing or fixating on the cat), drop the leash and actively supervise the dog and cat when they are together. Interrupt any inappropriate behavior on the dogs part (fixating on the cat, playing rough, or otherwise doing things the cat does not like) and ask the dog to sit to refocus the dog on you. Again, have patience, this can take 30 day or more.Do not leave the dog and cat unsupervised until you have seen 60 days of appropriate interactions. If the dog is the newcomer, make sure the cat gets plenty of dog-free attention from you. Make sure the dog has had a long walk or training session before introducing him to the cat. Dogs qualities that make for good cat friends: puppies, adult dogs who have lived with cats in the past, dogs who are laid back, dogs who don’t have a high prey drive (i.e. dogs who don’t get excited by squirrels outside). Cat qualities that make for good dog friends: relaxed and laid back cats, cats who have already lived successful with other dogs. Many rescues and shelters will introduce dogs to cats – referred to as a “cat test” – prior to adoption. 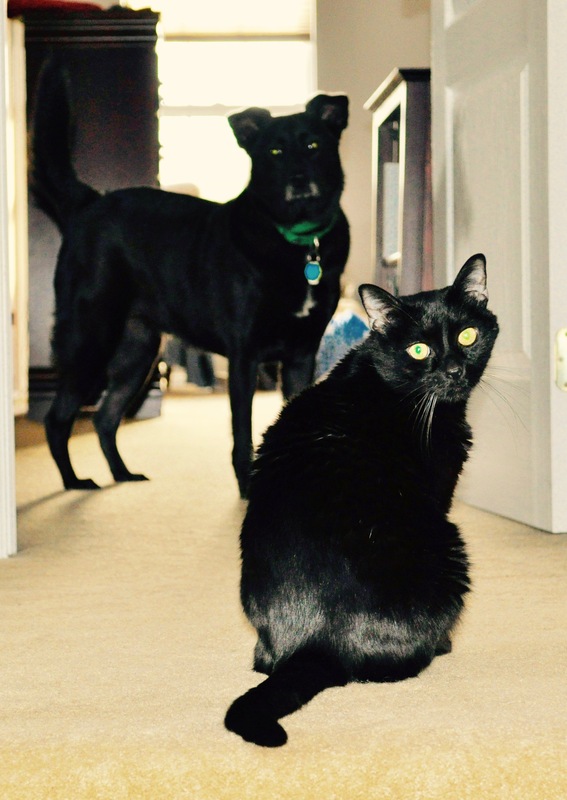 A positive cat test does not always mean that the dog will instantly be a good cat buddy. Many dogs are overwhelmed in shelter environments, so seeing a cat doesn’t register as exciting to them because they are also around dozens of other dogs, strangers, sites, and smells. If you are told a dog is “good with cats” that generally means that the dog did not have a negative reaction to a cat when exposed to one. Sometimes dogs don’t react in a shelter environment, but do get excited in a quiet home environment. Always assume that a dog will need time to adjust to a new cat, and the cat to the new dog, and make keeping them both safe a top priority for the first few months of them living together. If you bring a new dog home to live with your resident cat and things don’t seem to be going well, ask for help. A skilled trainer can help manage the introductions and also assess if the dog is a good fit for the cat. Making sure your dog gets some basic training can greatly enhance his listening skills around cats as well. Pepper’s Paws, LLC , All 4 Paws Rescue training partner, provides in home dog training and behavior consultations for basic manners, behavior problems, and fear aggression in Chester County, PA. We also offer group classes in everything from Puppy Basics to Advanced Adult Dog Manners to Tricks and Fun! Head trainer Deb Murray, is Certified Canine Behavior Consultant (CBCC-KA) and Certified Professional Dog Training (CPDT-KA) by the Certification Council of Professional Dog Trainers, a Fear Free Certified Trainer, an AKC Evaluator, and a Distinguished Graduate and Mentor Trainer for the Catch Canine Academy, and a Mentor for the Victoria Stillwell Dog Training Academy. Would you like a dog training quote?